It’s hard to put in words just how important a few models are for true BMW enthusiasts. On the shortest list of models that truly made an impact you’ll find the BMW M1, 3.0 CSL, M3 and, arguably, the first generation 8 Series. The latter was actually gone from the BMW line-up for about 20 years before the management in Munich decided to give the people what they had been asking for since the original was retired: a worthy successor. The original BMW 8 Series was a trendsetter from the moment it was launched. Looking at its design today, you probably could be fooled to think that it was created in recent years, and not actually penned at the end of the 1980s. 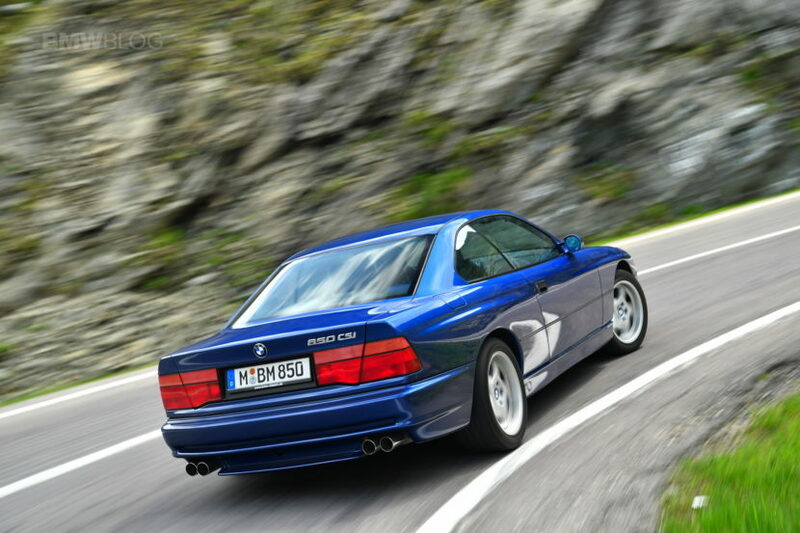 The E31 was ahead of its time for a number of reasons, design being one of them. It looked different, imposing and it had pop-up headlights, among other things. The front-end was long and sleek, while the rear end was wide and bulky, projecting an image of power, especially once the engine was turned on. That’s because under the hood of any 8 Series you’d find a special engine. Most were V12 units, but there were also two V8s offered over the years, a 4-liter and a 4.4-liter unit. No matter the configuration though, all units were atmospheric. As BMW proved along the years, the number 8 was always used for halo cars to some extent. Back then, the 8 Series was also a kind of technology flagship. When the car was originally launched, at the Frankfurt Motor Show in September 1989, it marked a couple of world premieres, the most important one to note being the fact that it was the world’s first road car to combine a V12 engine with a 6-speed manual transmission. As you can tell, despite the fact that the 8 Series was meant to be a V12 GT car, BMW still wanted to please its most passionate followers and offered a manual choice. Furthermore, the 8 Series was also one of the first cars to offer a drive-by-wire throttle as well as a multi-link rear axle, something of a novelty back then. The 8er was considered so cool that it became a ‘poster car’, despite the fact that it wasn’t a supercar or even the fastest model in the segment. As BMW proved along the years, the number 8 was always used for halo cars to some extent. From the 328 to the 8 Series, Z8 and i8, the number 8 was always glued to the rear end of special models. Back in the 1990s, it was the design that spurred the imagination of many, a design that is still stunning to this day, the lack of a B-Pillar making it standout in the crowd. In fact, the 8er was so desirable that it used to be mentioned in songs and featured in a variety of videos back then. So why did BMW retire it? Well, in short: bad timing. 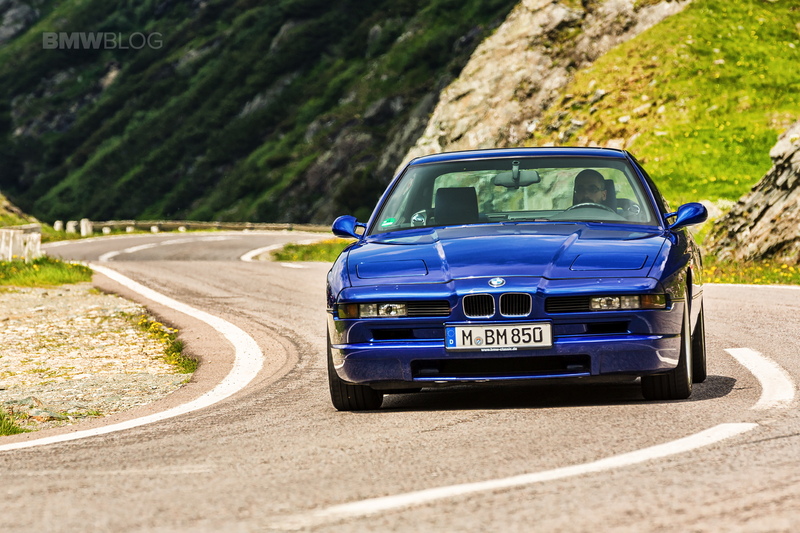 Soon after BMW took the veils off, a recession hit, right at the start of the 1990s, prompting a lot of people not only to reconsider buying one – as it was priced around $70,000 back then, the equivalent of $134,000 these days – but to hold off entirely. Furthermore, the engines used in these cars were huge V12s for the most part. With the Persian Gulf War happening, oil prices went through a veritable rollercoaster, making such a buy look like a bad deal. As a matter of fact, BMW had planned an M8 from the get go but since all these events took place at the beginning of the 1990s, the prototypes were buried, never to be seen again. Instead of the M8 we got the 850CSi, which was basically a predecessor for the M850i xDrive we can buy today. Unlike any other 8 Series model of its time, the 850CSi was using an engine that received such extensive work from the Motorsport division that it had a special codename: S70B56. Basically, the standard 5.6-liter V12 M70 engine of the 850i was tuned to deliver 375 HP and 550 Nm (406 lb-ft) of torque. Together with a couple of changes done to the rest of the car, like stiffer springs and a new steering rack ratio, this thing was as close to an M8 as possible and a true predecessor of the M850i xDrive of today. And that brings us to 2018, the year when we finally got to see how BMW thinks the 8 Series would have evolved over the two decades that passed since the original was retired. The first glimpse at it came in the shape of a concept, a concept that was a lot closer to production than we thought at the time. The revived 8 Series came back with a vengeance. Having such big shoes to fill, the new 8er had to be aggressive and provocative, had to make a statement from the moment you first looked at it and boy, does it deliver! From the front you immediately notice the atypical kidney grilles which have a more angled shape and are wider at the bottom than at the top. Then you notice the headlights which BMW claims are the slimmest fitted to one of their cars today, a great tribute to the original pop-up headlights of old. That sort of technology wouldn’t have worked today but by keeping the lamps so slim, the front end is sharp and, combined with the long hood, creates a similar effect to the original 8er. The same could be said about the rear end. It’s muscular and bold but most of all: wide. Just looking at it you can’t help but love the way the character lines flow from the front end to the back, going over the wheels and creating some of the widest wheel arches in the business today. Unlike the original though, the rear bumper and the general rear fascia is not nearly as simple and bulky. It’s complicated, has a lot of sharp lines but, somehow, it works with the 8er. They made it work and although the pictures might not do the car justice, in real life it truly is a stunner. Hop inside and the story continues. This was designed from the get go to be a luxurious GT car with sporty abilities and it delivers, combining great materials and design with a sporty flair, and it’s all done thanks to carefully placed lines. From the design of the seats to the dash and center console, everything looks like a mix between sport and leisure, all infused with luxury. The materials used are of the best quality and the wide array of configurations you can pick from, especially through the Individual program, allows you to create your dream car. Our tester was dressed up in Barcelona Blue, a color launched along with the new 8 Series and created to highlight its curves, according to BMW peeps. As this was also the top-dog, M850i xDrive model, it came with some M Performance bits that you don’t get on the other two versions available. Just like any other M Performance car, the M850i has Cerium Grey side mirror covers, an add-on in the front air intakes done in the same color and quad tailpipes at the back, to let you know this is no ordinary 8 Series. The engineers finally made the 4.4-liter V8 on this car sound good and that’s encouraging for the full-on M8. Therefore, we were met with a thunderous note the moment the start button was pressed. 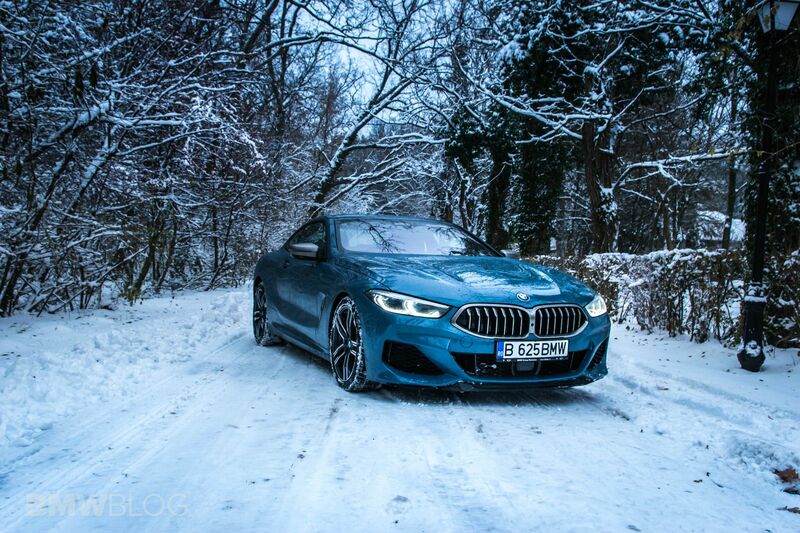 Under the hood of the M850i xDrive hides the latest incarnation of the N63 4.4-liter twin-turbo V8, this time taken to 530 HP and 750 Nm (553 lb-ft) of torque. I’m going to let those numbers sink in a bit, as they are a considerable improvement over the last iteration of this engine, which made around 450 HP, depending on the market. The torque figure is even more impressive though as it matches the one of the most powerful V8 BMW ever made, the 625 HP unit in the F90 M5 Competition. And this isn’t even a full-on M model, which shows just what kind of plans BMW has with the 8 Series. Whereas so far, I focused more on the luxury and looks of the car, it is now time to dwell into the tech bits and how this new 8 Series drives. The spec sheet will paint a pretty picture from the get go, giving you a hint of what awaits but nothing can prepare you for how well this thing drives, considering it’s a heavy, nearly 5-meters long GT car in the first place. You do understand that you might be in a bit over your head though from the moment you start the engine. The engineers finally made the 4.4-liter V8 on this car sound good and that’s encouraging for the full-on M8. The note of the cold engine is deep, mean and comes with a certain growl that goes up as you accelerate, especially noticeable in Sport mode, when the flaps in the rear mufflers open up. The whole experience is even more enticing when you shift gears and on overrun as the burbles coming from the rear end of the car will make the hairs on the back of your head raise. 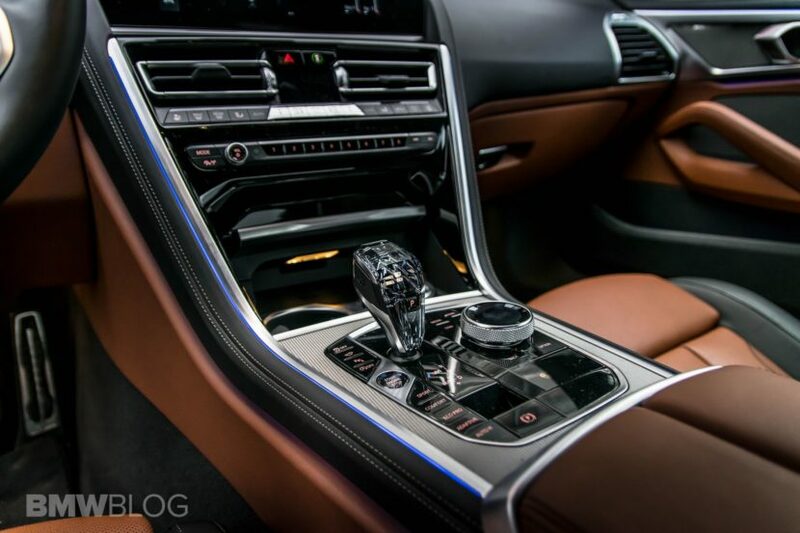 You wouldn’t feel that though because by the time that happens, your head will be quite hard pressed against the headrest from all the torque and power sent to all four corners of the car, thanks to the xDrive system. 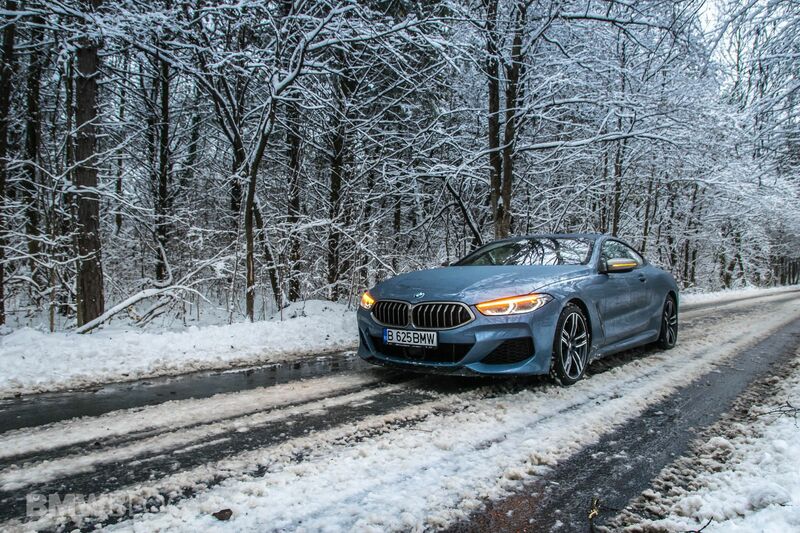 Some have frowned when learning that the M850i will be available solely with xDrive, but after driving this beast, especially in some snow as winter creeped in, I can wholeheartedly say that this was a wise move, not just because you feel more secure and get better grip but also because the xDrive system is different than on other cars. For the M Performance 8er, the xDrive system comes with a locking differential on the rear axle which means you get to have a lot more fun with it than before. 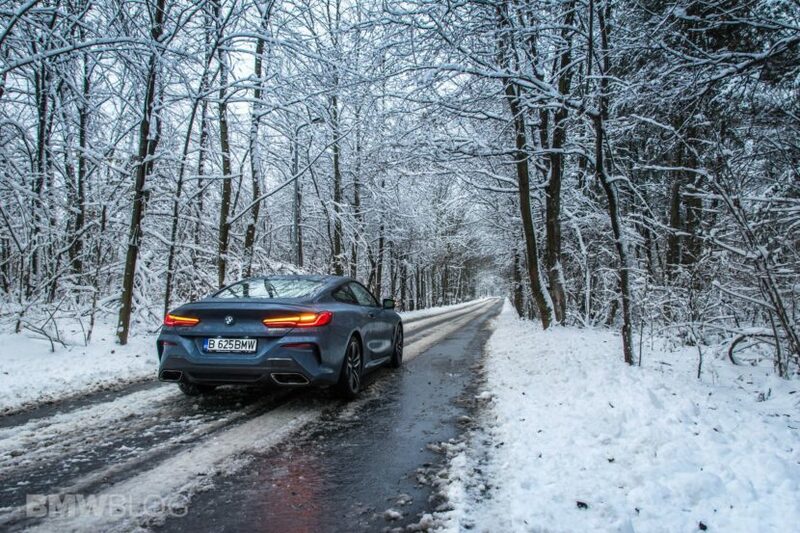 Having snowed during my time with the car, I definitely put it to the test in a variety of situations and can attest to the fact that the rear end feels incredibly lively. But what surprised me the most was how agile this thing felt throughout the time spent behind the wheel, considering its sheer size. It’s a rocket from standstill and it delivers such an enticing sound that you’ll have a hard time keeping things legal. A lot of the credit must be going to the integral steering which turns the rear wheels either in the same direction as the front ones or opposite, to make sure you get the most out of your car, no matter the situation. What that means though, in real life, is that when you’re around town, you get to drive this large coupe through the narrowest spaces easily, even though visibility isn’t perfect. You get to see plenty out the front and sides, but the rear visibility is hindered by the massive hips to the sides and by the narrow gap you have to look through in the back. 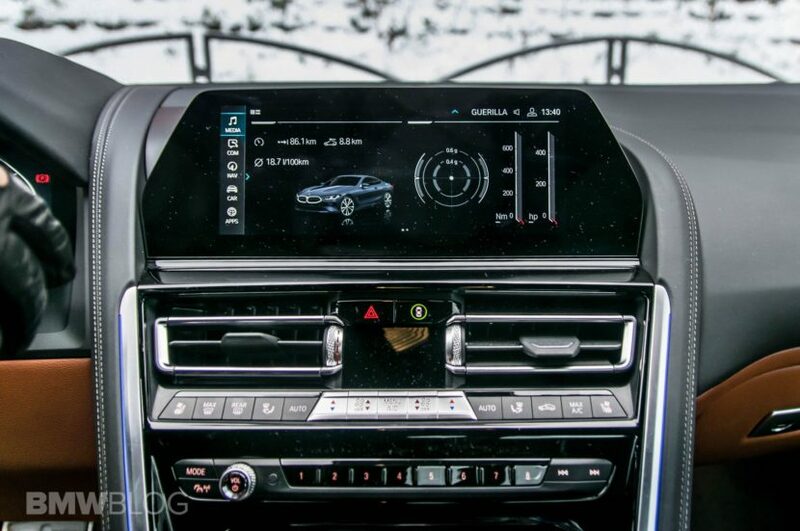 I guess that’s one of the reasons why BMW decided to remove the headrests for the rear seats, to make sure you actually get to see something when using the rearview mirror. It’s not like you’ll ever use those rear seats anyway as they are small, by any definition of the word. Yes, I did manage to squeeze someone in there but I could only torture that person for a couple of miles at a time. Speaking of practicality, the 8 Series has a generous boot, where you can fit plenty of things, but the opening is rather small so you might want to check before packing a suitcase that may turn out to be too thick to fit through it. Inside the cabin there are plenty of storage spaces, especially in the back, since you won’t be sitting anyone there for longer trips and you get to use the space for storing more luggage. 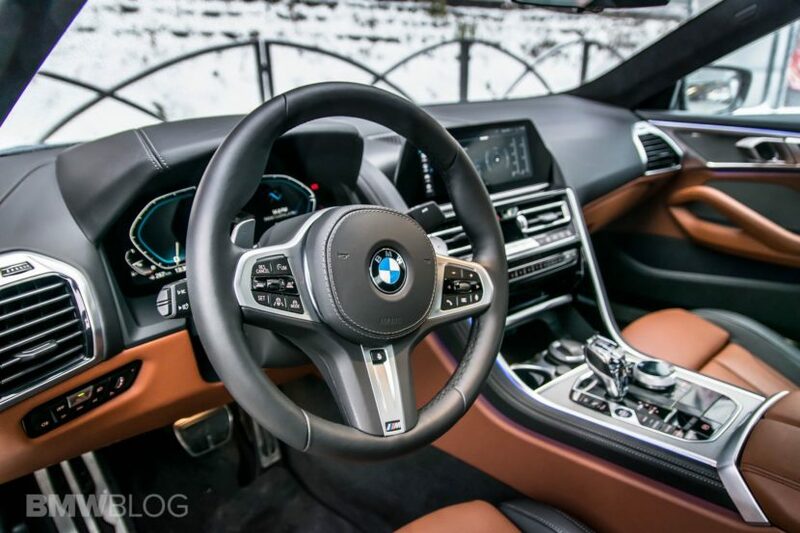 Getting back to the driving experience, around town you’ll notice that the M850i xDrive is well behaved even though the 530 HP of the V8 under the hood will act up all the time. It’s a rocket from standstill and it delivers such an enticing sound that you’ll have a hard time keeping things legal. Doing 62 mph from standstill in 3.7 seconds means this is one of the fastest cars BMW ever made, being beaten solely by the F90 M5 and being on par with the 610 HP M760Li xDrive. What’s more interesting though is how fast the turbos spool up, considerably reducing turbo lag compared to the previous iteration of the same V8. The throttle response is incredibly sharp and provides a quick blow to the back of your head if you’re not paying attention. 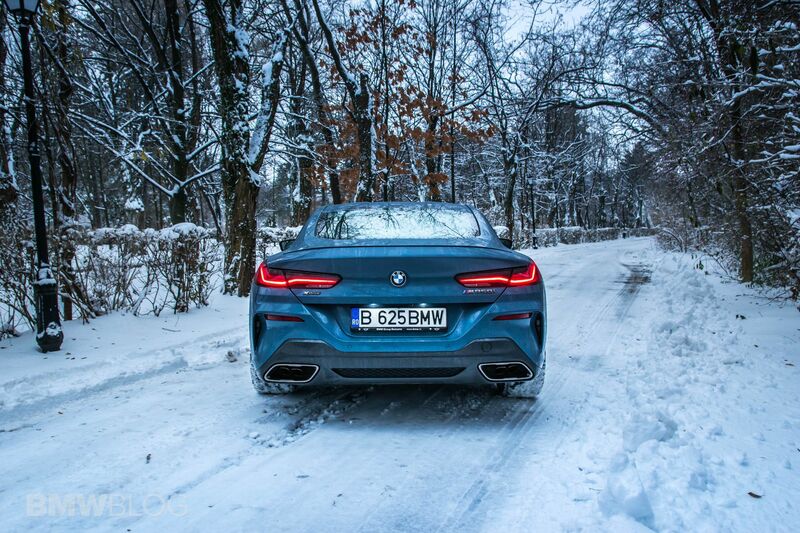 Breaking is quite brutal as well, as BMW made sure to provide you with large enough discs and powerful calipers to keep this 1,965-kg beast in check all the time. And as you read that figure, one can only wonder how can an 8 Series be this heavy yet hiding its heft really well. Some of the tricks have to do with active anti-roll bars, for example. Don’t think that it feels close to a car like the M2 though, but for its size, it feels a lot better than you’d expect, even when you take it to the limit. I did try to push it as hard as possible but the slippery roads didn’t exactly allow me to see how it handles at 10/10. Nevertheless, I did feel the playfulness of the chassis all the time and how it easily molds to what you want it to do. The steering offers some feedback but don’t expect it to be miraculously different than what you get on other BMW models these days. All the time driving the new M850i, I felt like I was actually in a sort of weird V8-powered BMW M4, not in a considerably longer and heavier 8 Series. That’s a testament to how well engineered this car is. Sure, it’s not nearly as efficient as the M4 as the average fuel consumption around town was about 20 l/100 km (11.7 mpg), but it was surprisingly economical outside of town, with one of my trips showing a fuel consumption figure of just 8.5 l/100 km (27.6 mpg) at an average speed of 83 km/h (52 mph) and that’s just amazing in my book. Another thing I feel I have to mention is the attention this car gets everywhere. From mall parking lots to highways and gas stations, people are somehow crazy about getting as close as possible and admiring every aspect of it. The number of thumbs up I got was only rivaled by the BMW i8 Roadster which proves that the number 8 holds a special place in Munich. 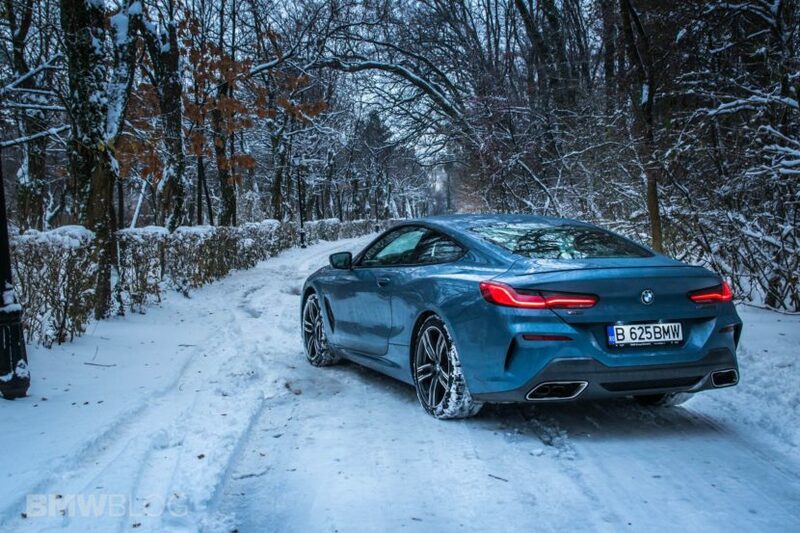 Some would say that the 8 Series is way too expensive, no matter how good it is, but I’d say it’s priced just right. 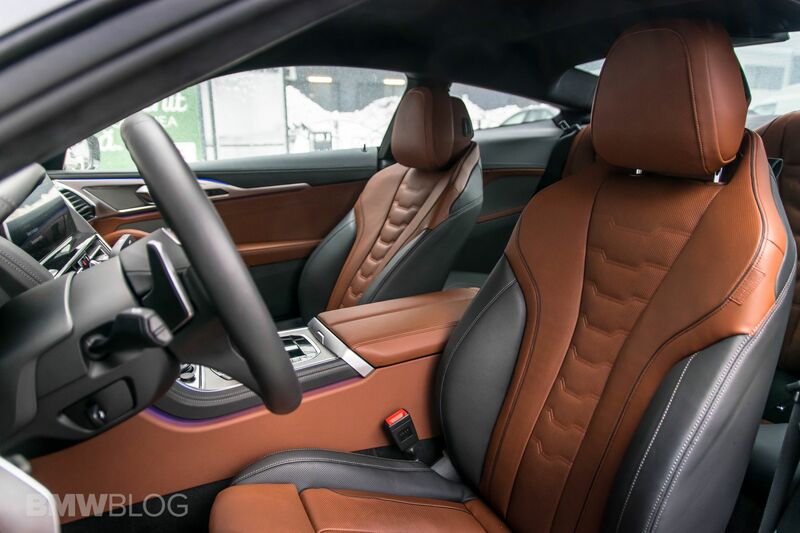 Its main rival is the Mercedes-Benz S-Class Coupe, even though BMW officials don’t see it that way, considering their offering to be clearly sportier, intentionally leaving some luxury and comfort behind to allow you to squeeze every bit of performance out of it. But compared to the S-Class Coupe, the 8 Series is cheaper, even though it’s more powerful and a lot faster. And yes, I’ll admit the interior of the S560 feels a bit more special, even though I’m not a fan of the huge-screen-thrown-on-the-dash thing, but when it comes to driving, the M850i is considerably better in every way, not just straight-line acceleration, meaning the target set in Munich was definitely achieved. 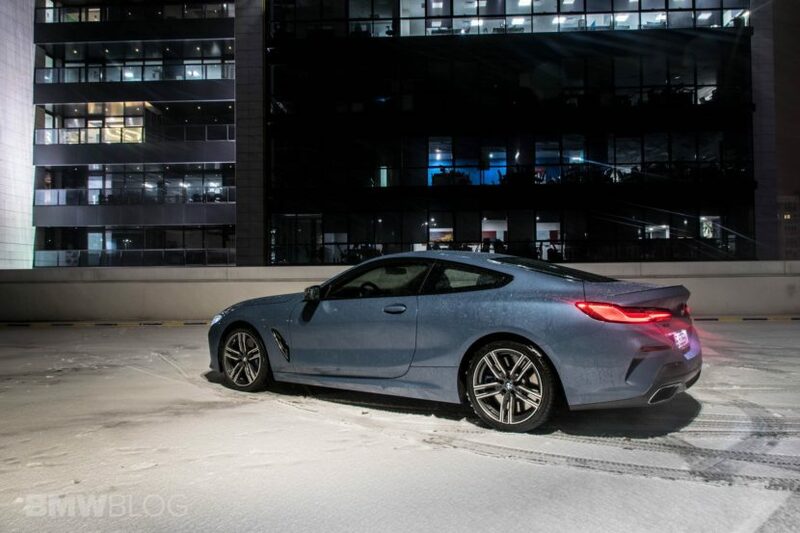 All the time driving the new M850i, I felt like I was actually in a sort of weird V8-powered BMW M4, not in a considerably longer and heavier 8 Series. That’s a testament to how well engineered this car is.